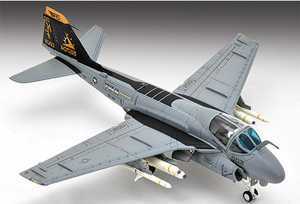 YellowAirplane.com: A-6 Intruder / EA-6B Prowler Military Scale Model Planes and A6 Airplane Models. A-6 Intruder / EA-6B Prowler Military Scale Model Planes and A6 Airplane Models. 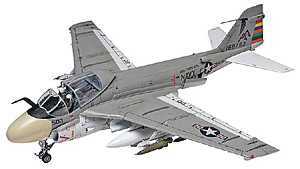 A-6 Intruder / 6B Prowler EA-Militar Aviones Escala modelo A6 y modelos de aviones. 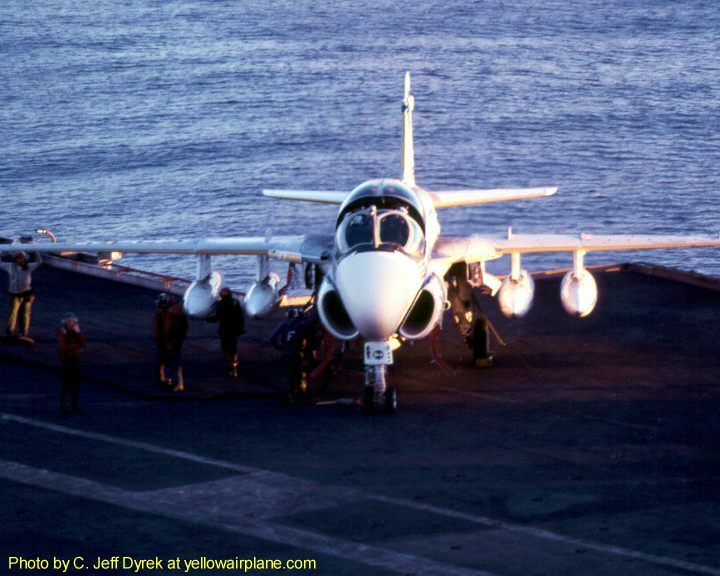 A-6 Intruder - EA-6B Prowler section. In the Military Fighter Jet Model Department. Filled with A6 Jet Fighters and Fighter Jet Models. Grumman A-6 Intruder and EA-6B Prowler scale model planes, plastic model planes, A6 Jet Fighters mahogany models, and die cast Military Fighter Jets model airplanes. The A-6 Intruder jet fighters come in two major versions, the A-6A, a two seater used for both bombing and as a tanker, and the EA-6B a four seat electronics countermeasures version called the Prowler. The A-6 Intruder jet fighters were manufactured by Grumman Aircraft Company. The A6 Intruder is 59' 10" long, 16' 3" high and has a wingspan of 53' 0". The A6 has an empty weight of 32,160 lbs and a max weight of 65,000 lbs. The A6 Intruder jet fighter uses two J52-P-8A engines each producing 9,300 lbs of thrust each for a total of 18,600 lbs of thrust. The Intruder had a cruise speed of 482 kts and a max speed of 658 kts and a maximum range of 1628 miles. The military A-6 Intruder is one of the first all weather light attack bombers using special electronics and a navigational device called the "Highway in the Sky." Just one more note: The A-6 is one of the loudest aircraft I've ever seen. On the USS Kitty Hawk, the A-6 was the loudest plane that we had. Here are some search phrases to help in future web searches of the A-6, A6 Intruder, A-6, EA-6B, Prowler, A-6 Intruder. These military model planes come in plastic model plane kits, wooden plane models, die cast model planes and mahogany model planes. The Specs on this page cover only one model of the A-6 Intruder. There are many different models with different specs. Webmasters Note: This is a fantastic movie that has great action shots of the A-6 Intruder over Viet Nam. It is great to build a model and watch a movie about this airplane. Check for the SUPER LOW on this great video of the A-6 Intruder in Action. This Vietnam War computer action game recreates the intense aerial combat that took place in the skies over North Vietnam. You'll choose from more than 12 aircraft - including the F-100 Super Sabre, F-105 Thunderchief, A-4 Skyhawk, F-4 Phantom II, F-8 Crusader, A-6 Intruder and B-52 Stratofortress - to fly air combat missions from 1965-1968's Rolling Thunder through 1972's Linebacker II. For Windows ME or above, Rated T.
Depicts the dramatic launch of the venerable A6 Intruder attack aircraft. Display the full variety of the U.S.' Vietnam War airplanes on your wall! Featuring everything from the A-6 Intruder and F-105 Thunderchief to the B-52 Stratofortress and C-141A Starlifter, this poster measures 23"x 17"
This dramatic print depicts the USS Saratoga in her prime during operations off the coast of Vietnam circa 1970. This head-on view projects the power that the Saratoga wielded during the later part of the Vietnam War as well as the reliance on the A-6 Intruder as the Navy's primary attack aircraft during that conflict. Signed print measures 20"x 30". During the Vietnam war, many air crews were frustrated by the political nature of target selection. Real, worthy targets of military significance were put off limits to avoid annoying the enemy or the allies of the enemy. Instead, missions were sent against "suspected" targets like truck parks and staging areas more often than not, this resulted in the bombing of some innocent trees. That would be frustrating but not necessarily infuriating. What was infuriating is that crews were lost and killed in the missions to worthless targets. Flying his A-7 Corsair through the gauntlet at Mu Gia Pass in the Annamite Mountains between North Vietnam and Laos in 1969, Lt. Russel Rajani of Attack Squadron VA-56 drops 500-pound "Snakeye" bombs and strafes the road in an effort to slow movement of supplies on the Ho Chi Minh Trail. Click Here to see the A6 Intruder on the USS Kitty Hawk in 1977. This A-6 Tanker was on the USS Kitty Hawk in the South China Sea in 1977 and 1978 aboard the USS Kitty Hawk. ">Click Here for more aviation art. Yellow Airplane Gives You the Best Source of Airplane Models, Airplane Books, Airplane Movies, Aviation Art, Aircraft Calendars, Airplane Tools, Exhibits and MORE!